Bandel, 1991 concludes from protoconch studies, that Loxonematoidea might be the ancestors of the Stromboidea. I collected that specimen in 2003 from the middle Devonian Mahantango Formation near the little town of Gore, Frederick County, Virginia. I made the identification based on the book Fossil Collecting in the Mid-Atlantic States by Jasper Burns (1991, Johns Hopkins Press). Loxonema is the only high spired gastropod listed for the Mahantango Formation, although the illustrations in the book are of an internal mold (p. 85), and a specimen encrusted with bryozoans (p. 113), so it is difficult to be sure. There are 2 species listed in the book from the Mahantango Formation, L. delphicola and L. hamiltoniae. It is difficult to tell whether my specimen has a finger on the body whorl, or if it is the rim of the aperture because the matrix is covering it up. 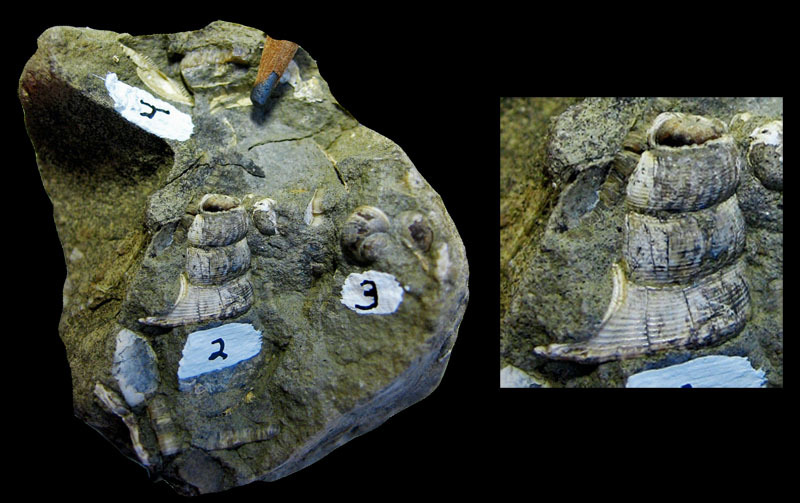 The block containing the "Loxonema" (specimen number SVDM IP-52.2) also contains some sort of ammonoid, an indeterminate gastropod (3) and a small bivalve called Phestia (4).